This articles going to get a lot of hate, there’s no way around that. Mesomorphs will simply arrogantly state they have the best body type because it is in the goldilocks zone between short and squat endomorphs and long and skinny ectomorphs. Naturally, you can make a solid case for any body type, but seeing as this is skinnyyoked.com, today the case will be made for the hard-gainers. Which Would You Rather Struggle With, Bulking or Cutting? Evaluating an entire “body type” is difficult. There are thousands of variables that will ultimately produce a great, moderate or poor physique and much of it is a matter of choice and not hereditary. For example, look at 6’1 Greg Plitt in his prime. Or the almighty Zyzz, he was 6’2. You know who else was 6’2? Arnold f*cking Shwarzenegger. 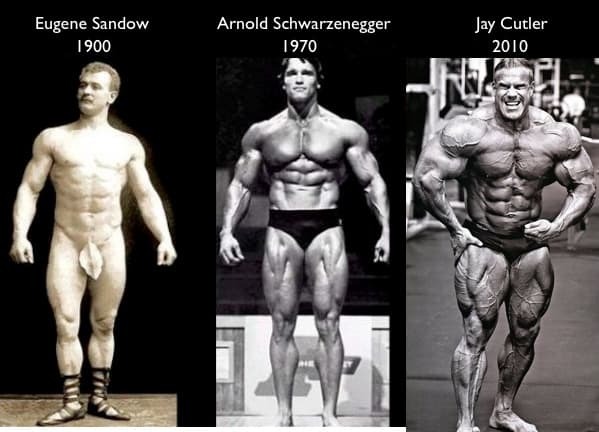 While some argue the different between just being a tall mesomorph and a jacked ectomorph, the obstacles tall lifters like these men overcame to reach their maximum potential just go to show what is possible with the right workout, diet and yes, in most cases steroid use. But steroids aren’t magic. You still have to go in the gym with the mind of an animal to breakdown the muscle to let the drugs to their job. You can apply this same beast mindset to natural lifting to maximize your own physiological potential. Just because some body types have higher “ceilings” than others, like a guy born with massive forearms and calves doesn’t mean you can’t become a 6foot+ monster. Also, the ceiling point is kind of moot because once you’re jacked your jacked. For example Scott Herman from Herman Fitness looks huge next to average Joe, but next to Kai Greene he’ll look tiny, and even Kai next to the likes of Big Ramy will look smaller. Even though it requires more work to achieve an impressive physique as an ectomorph, once it is attained it looks all the more impressive. Why does it require more work? It comes down to skeletal structure. Take a femur bone for example. You have to equal sized 5 pound balls of clay to represent muscle mass. You have one stick that is 1 foot long. You have another stick that is 1’6″ long. Now mold the clay around the length of the sticks to add “muscle” tissue to the bone . The longer bone will look less impressive because with the SAME amount of muscle it’s stretched over a longer surface area. The shorter the stick the more condensed the clay and thus, more aesthetically impressive. However, add another 3 pounds to the long stick to compensate for extra length and put next to each other it will be the ectomorph that presents an overall more aesthetically appeasing physique. Of course, this is all dependent on adding that “extra” 3 pounds, and there is no denying the impressiveness a bulging endomorphic physique will present to the eye. Currently, the “huge” factor is still very much alive in bodybuilding, however there is a growing amount of dissent amongst bodybuilding figureheads who feel todays physiques are “too big” and that the physiques of the 1970’s with the likes of Arnold, Frank Zane, Columbo, and Dave Draper. If there is a shift towards a more “classic” physique, ectomorphs stand to benefit as they are naturally more inclined to longer spreads, smaller waist ratios and lean vacuum-abs. Ectomorphs are also often referred to as “hard-gainers” because of their high metabolisms and how that inhibits their abilities to add mass. We here at Skinny Yoked know that pain, and it is real. This is a real problem, when your body is burning calories faster than you can consume them you have to work harder than a body that utilizes it’s energy at a different pace. For many other body types though the opposite is true, slower metabolism rates mean that calories carry an extra heavy burden. Both are serious problems that can create endless frustration for the eager young natty lifter. However, if you were an alien that just landed on earth and were given two problems to choose from, the inability to gain wait and burden of consuming more food or the inability to burn calories fast and the burden of dieting, which would you choose? That’s what I thought. Every time someone with a slow or normal metabolism hears a hardgainer complain about not gaining wait it’s like hearing a naturally well-endowed woman complain about the burden of having large breasts. Sure, eating and eating is a chore, but eating itself is much better than dieting, and thus the problems hardgainers have in regards to diet are of a different stripe than “easy-gainers”. So if your frustrated that your endomorphic friends are out-lifting you or just looking more hulk-like, take comfort in knowing you have to go home and eat steak, some whole grain pasta and half a tub of ice cream tonight and he/she will instead be having fish and rice only… again… for the 107th day in a row..
Finding a good workout partner depends on many different variables, from time scheduling to years of lifting experience to personal goals. There’s no point working out with someone who won’t be there to spot you if you’re trying to reach strength goals, and there’s no point working out with an all natty if you’re aiming to be the next Jay Cutler . So finding someone with a similar lifestyle and similar goals narrows down the selection of partners for many lifters. You see many endomorphs end up with other endomorphs and ectomorphs with ectomorphs. However, try working out with a conflicting body type to push your own progress in your naturally weak areas. For example, as a tall skinny guy more inclined to hypertrophy work try working out with a shorter more solidly built guy who prefers compound strength-oriented lifting. The endomorphic lifter will have a mechanical advantage over you in many lifts, and all else equal (age, years lifting, diet) will be able to lift more than you. This is a good thing. Working out with someone stronger than you is one of the single greatest guides for keeping you making gains. Look at Arnold Shwarzenegger and Franco Columbo. 6’2 and 5’5 respectively, a tiger and a bear, competitive and having fun with it; that’s what it’s all about! My whole life I’ve tried my best to seek out lifters that have some advantage over me or are just more experienced or larger, because then I’m always playing “catch up”, and if you are competitive, this is one hell of a motivator. If you are working out with someone with the same body type and same strength levels be careful not to allow the symbiosis to lull you into stagnant gains. Challenge each other and be competitive to create a sense of urgency, just as you would if you were training with someone more developed than yourself. If you’re reading this and you are an ectomorph you probably feel pretty good. If you’re reading this and you’re not an ectomorph you’re probably feeling a bit spiteful. In actuality, everyone reading this SHOULD feel good. Why? Because a endomorph in his prime state is just as impressive as an ectomorph in his prime state, even if they are slightly different states. Both grizzly bears and tigers are impressive, even if one is generally “thicker” and one “leaner”, they’re both culturally admired and respected predators in their own right. This post is more of a pep talk to the string beans, because as editor of Skinny Yoked I would have liked to read this as a teenager in my high school gym when naturally broader guys were making more rapid progress than I was. I learned however that while body type is a factor, it’s not the determining factor. The determining factors is all in your head.. it’s how much determination you have, how much persistence you have, how much willpower you have, and how well you plug your visions of yourself into your physical form. Connecting and iron mind to muscle is the single most influential factor when determining ultimate personal potential. Without the mind, the body type, diet and even performance enhancing drugs won’t matter. Last Updated on March 28th, 2019For the longest time, cardio was practically a bad word for bodybuilders. You would find any bodybuilder worth his salt, hitting the weights and focusing their efforts on strength training.